The Girl With the Whispering Shadow is a strong, sensitive fantasy novel about coming of age and coming into your own natural-born powers. 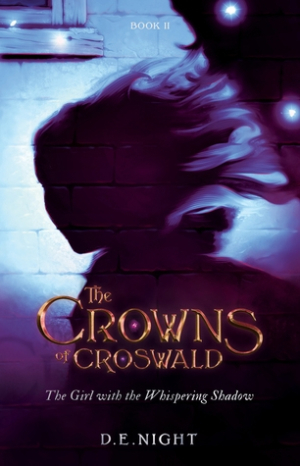 Filled with fanciful flourishes, The Girl with the Whispering Shadow is the second volume of the Crowns of Croswald series. Ivy Lovely adventures through an extremely enjoyable fantasy world drawn with unusual care by author D. E. Night. This young adult fantasy novel weaves together themes of growing up and learning to become your true self—life’s greatest magic trick. Ivy returns home from school in a soaking-wet feather gown with no memory of what happened the night before. Her natural-born magic is no help; all she knows is that she still carries the Kindred Stone hidden in a deep pocket of her cloak. And she stinks of the Dark Queen, her wicked adversary, a sorceress who’s determined to keep Ivy from fulfilling the Moonsday promise. Ivy must use her magic quill and every resource at her disposal to find the missing facet of the Kindred Stone and return to school at Halls of Ivy. Under these phantasmagorical themes is Ivy herself, a canny, able heroine who’s just stepping into her own power. As she learns her own limitations and abilities, she’s engaged on an empowering journey to connect with her inner self. The Girl With the Whispering Shadow builds on Ivy’s self-discovery, and as she pursues the second facet of the Kindred Stone, she also learns what her true purpose is. She is supported by a lively group of friends and her loving parents. There are no stereotypes here; Ivy’s world is populated by well-drawn, diverse characters and feels natural, even with all its magical elements. The novel has a wonderful balance of description and dialogue, and it maintains a playful tone even in difficult scenes of conflict or battle.